If your family is anything like ours this time of year is super busy. Between church gatherings friends and family we have 11 functions within a 2 week span. I need to bring baking or an appetizer to almost all of these parties. Here is one of my favorites. 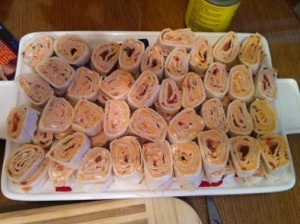 i call them Mexican wraps.. It’s kind of like the taco dip minus the chips and it not being a dip! Mix ingredients the night before you need them. They tend to set better. 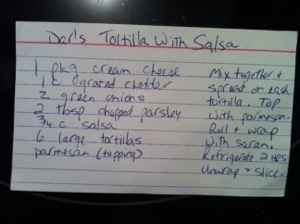 Spread evenly on large soft taco shells. 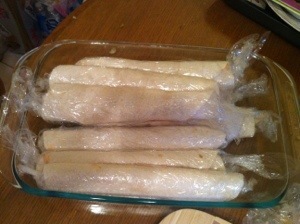 And roll each one in clear plastic wrap. 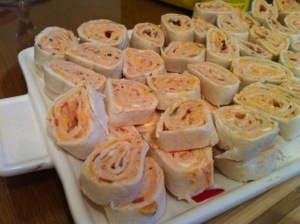 Stack them all in a baking sheet or pan once wrapped and refrigerate over night. 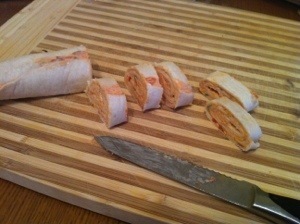 All you need to do before serving is unwrap and cut into little slices. Mess free reasonably inexpensive and super yummy. What are your favorite go to recipes that you go to in a pinch this time of the year?